We invite you to explore the biography of Australian composer Ros Bandt, as it is presented in Grove Music Online. (b Geelong, Victoria, 18 Aug 1951). Australian composer, performer, installation and sound artist, instrument inventor, writer, educator, and researcher. Her early education consisted of high school in both Australia and Canada, followed by a BA (1971, Monash University), Dip Ed (1973, Monash), MA (1974, Monash), and PhD (1983, Monash). An interest in experimental music is apparent from her earliest compositions, many of which involve performance in specific places, improvisation, electronics, graphic notation, and the use of self-built and specially built instruments. These include Improvisations in Acoustic Chambers, 1981, and Soft and Fragile: Music in Glass and Clay, 1982. By 1977 an interest in sound installation and sound sculpture had become well established in her work (Winds and Circuits, Surfaces and Cavities), and is an area in which she has continued to the present day, having presented nearly 50 sound installations worldwide. 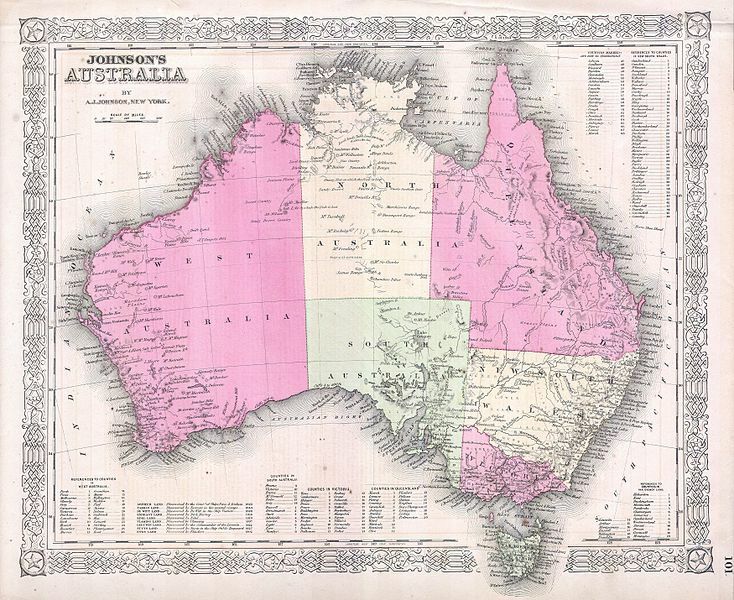 Johnson’s Map of Australia. Public domain via Wikimedia Commons. Bandt has also been involved in creating electro-acoustic works, often in collaboration with broadcasting organizations; work for or with radio forms a significant portion of her output. Many of these works, while using real-world elements, take a more narrative or illustrative approach to their material compared to the abstractionism of much electro-acoustic work. An electro-acoustic work such as Mungo (1992), made of sounds collected in the Lake Mungo region of New South Wales, presents soundscape as illustration; that is, the sounds are presented as important in themselves, rather than as material for formalistic musical development. In other electro-acoustic works, such as Thrausmata: Ancient Greek Fragments, 1997, the concern for narrative, and presenting endangered elements of the soundscape (in this case, disappearing languages) emerge as paramount. Other electro-acoustic works present sounds from specific environmental sites, such as Genesis (1983), for microtonally-tuned zither and pre-recorded speed-changed zither, both recorded in the same large resonant environment, and Stack (2000), made entirely from sounds collected from a large cylindrical tunnel exhaust stack in Melbourne. Of her compositions for instruments, Ocean Bells (1982) uses the Flagong, a glass instrument made by Bandt modelled on Harry Partch’s Cloud Chamber Bowls. The sculpture Aeolian Harps (1987) was a large wind powered string instrument, which was also recorded and those sounds used in a number of other works. Her recent Tragoudia II uses the tarhu, a 12-string spike fiddle (4 strings played, 8 sympathetic) invented by Australian luthier Peter Biffin, as well as pre-recorded sounds recorded in Crete. Tin Rabbit (2009–10) for wind-up rabbits, pre-recorded soundscape, music boxes, and tin suitcase shows a more whimsical side of her installation work. Free Diving (2008) for recorder orchestra and pre-recorded soundscape shows an integration of her interests in environmental sound with that of composing for traditional instruments. Bandt has been equally active in collaborative work with musicians, dancers, and artists. She has been part of the groups La Romanesca (early music performance), LIME (improvisation), Back to Back Zithers (cross-cultural improvisation and composition), and Carte Blanche (a digital media duo with Brigid Burke), among others. She has also worked on many collaborative projects, such as Hear the Dance, See the Music (1989), a collaborative music-dance-technology performance; The White Room (1992), an installation for Warsaw Autumn, produced with Vineta Lagzdina, Warren Burt, Ernie Althoff, and Alan Lamb; and an ongoing series of collaborations with the German sound artist Johannes S. Sistermanns. Bandt has written several books, including Sound Sculpture: Intersections in Sound and Sculpture in Australian Artworks (Sydney, 2001), the first comprehensive treatment of this kind of work in Australia. With Michelle Duffy and Dolly MacKinnon, she edited the anthology Hearing Places: Interdisciplinary Writings on Sound, Place, Time and Culture (Cambridge, 2007). She is also the director of the Australian Sound Design Project, the first comprehensive website and on-line resource, documenting over 130 Australian sound designers, composers, and sound sculptors. She has received grants from the Australian Research Council, The Australia Council, the Victorian Ministry for the Arts, the Australian Network for Art and Technology, and a number of other organizations. Her work has been broadcast on, and commissioned by ORF Austria, WDR Germany, ABC Australia, and Japanese Radio and TV, among others. Recordings of her work are available on the Move, New Albion, Ars Acustica, Sonic Art Gallery, and Au Courant labels, among others.